On October 5th last year my Grandpa died, he was 91 and very ill, but it did come as a huge blow to myself and our family. This was T's first experience of death either human or animal and we were completely unsure as to how we could help him understand. Not being religious, and not really having any firm beliefs about death, we were unsure as what to tell him. We lost The Hubs father 8 years ago and so we had always told T that had another Grandad but that his Grandad Bramham was in the sky and it was too far away to visit, and that he could see T and if he spoke to him, his Grandad would hear. So we used this approach for my Grandpa too. I think it's really important for us to talk about our deceased loved ones and much prefer to talk about them than to pretend they never existed, here are a few things we do to commemorate T's Grandad and Great-Grandpa. I hope you find them useful. 1. We always talk about them, especially Grandpa, as T knew him we talk about things they did and what he was like, T remembers where they lived and that he used to make pretend cups of tea for him. 2. Have visual reminders, we have photos of both T's Grandad and Great-Grandpa, he helps to dust them and we talk about them, T makes up little stories about what they are doing 'in the sky'. 3. Visit the graves from a young age so it becomes normal. We visit the graves every couple of months or so, T's first words are always 'Hello Grandad' or 'Hello Great-Grandpa', he knows where we are going and that we are putting flowers down for them. 4. Let your child pick or choose flowers to take to the cemetery, this makes them feel very grown up and always makes T feel as though we are trusting him with something very important, he also loves helping to put them in the vase. 5. Mark special occasions, on birthdays we 'celebrate' by eating their favourite desserts, trifle for Grandpa and profiteroles for The Hubs Dad. T now associates profiteroles with his Grandad even though he never really knew that he loved them. 6. We marked the anniversary of Grandpa's passing with a walk along the canal where his ashes are scattered and then went for a family meal, which he would have loved to have done, had he been alive and able, this is something we have all said will we do every year and expect the Great-Grandchildren to continue to do. 7. At Christmas we have memory ornaments on the tree, each year since the first year we lost The Hubs father, we have bought a bird Christmas decoration to hang on the tree, last Christmas we started this tradition for Grandpa, allowing T to choose what animal we should get, he chose a deer so from now on we'll be looking for a deer too. 8. We also light a candle, again on the anniversary we light a candle in the evening and just have a few minutes to think of our loved one. 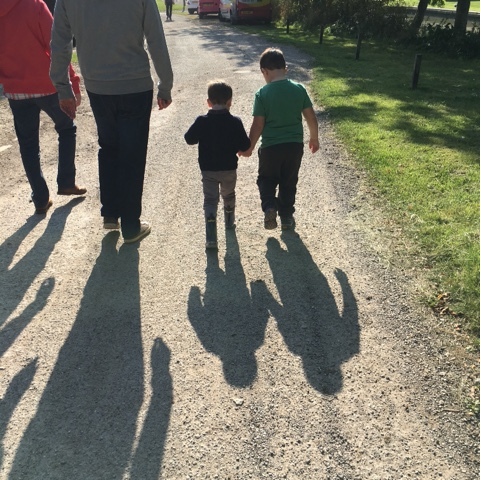 This is a picture taken on our memory walk for Grandpa last Sunday. 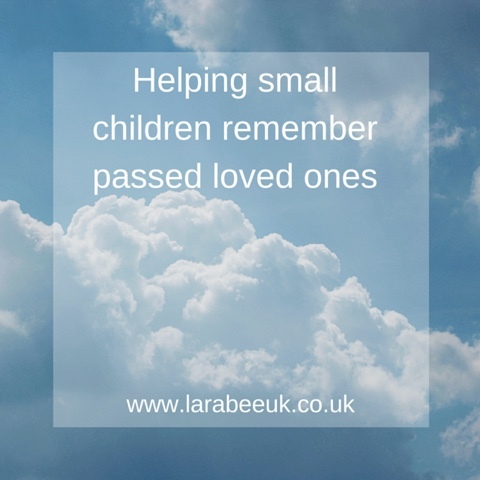 What do you do to help your small child remember your loved ones? I'd love some more ideas. These are very important tips. Both of Adam's Grandads died before Adam was born yet we still talk to him about them and we used their names within his middle name. Pinned this for future reference. I once got into a conversation with G about where my husbands grandad is after she saw a photo and I wasn't prepared at all and it went dreadfully. I've been to scared to broach the subject again. Some lovely ideas here. What beautiul ideas, such precious wisdom for T to learn from a young age! It really is so valuble to kids to have an understanding of death! Thankyou so much for sharing!